For over 50 years, Duplo has set the standard with some of the most innovative and reliable finishing products in the print industry Duplo products now encompass a vast range of finishing processes, from saddle stitching, booklet making and perfect binding to cutter-creasers. As the sole supplier of Duplo in Ireland, Neopost is proud to serve a widespread community of Duplo users who rely on this print and finishing equipment to tackle their demanding workloads. This article features four of Neopost’s Duplo customers, each highlighting how their print-finishing equipment has benefited their business. “We’ve grown up with Duplo and we trust them,” said Brendan Ring, Managing Director at CUBE Printing in Limerick, who has been using Duplo print-fi nishing equipment for over 20 years. CUBE is a leading provider of design, print and packaging solutions. 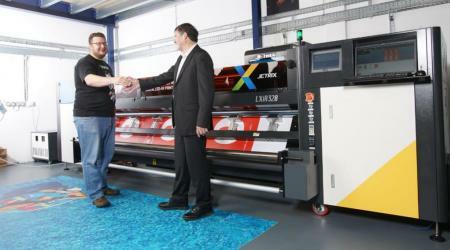 To continue to cater for its diverse client base, CUBE invested in the Duplo System 6000i through Neopost. The System 6000i is a reliable production machine in the long run range with short changeover times. This machine was the perfect match to accompany its existing Duplo System 5000, installed in 2015. Brendan says that IFU’s (Information for Use) booklets are important to the business. These require a robust machine and that’s why CUBE chose the Duplo System 6000i. With a large throughput, the Duplo fi nishes to a high-quality saddlestitch finish that ensures industry requirements are met. It also combines the construction of the DBM-600 booklet maker and trimmer with the high-speed DSC-10/60i collator tower. The in-line camera system verifi es that the page sequences are correct, giving the end user a guarantee that booklets are manufactured to specifi cation. With different clients requiring various services, CUBE needs to rely on its systems and equipment. “Knowing that the Duplo System 6000i is an integral part of our manufacturing brings real peace of mind to us here at CUBE,” said Brendan. 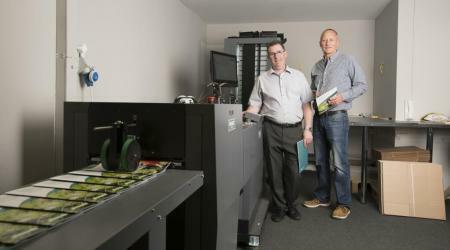 Founded in Dublin in 1998 by Willie Carroll and Tom Lyon, Bridge Print offers a range of cost-effective print solutions. In 2016, Willie and Tom were looking for a machine to upgrade their older smaller booklet maker. The criteria Tom and Willie used in their search was reliability; they needed a machine that would withstand constant use on their hectic print schedule, not jam with staple problems and was easy to programme. After a lengthy search process the Duplo System 6000i, supplied by Neopost Graphics, was chosen as the perfect machine for Bridge Print. “We bought it in January of 2017. We use it almost every day and there’s so much you can do with it,” said Willie Carroll. Co-Director Tom Lyon is one of the main operators of the Duplo System 6000i and he can save settings, allowing the machine to set itself up for different runs. It also allows the user to complete the entire booklet-making process in-house. Since acquiring the Duplo System 6000i, Bridge Print has been able to print in sizes right down to CD brochures. “For a 10,000 book order, you can run the machine at speed and still have time to count and pack, thanks to the long delivery available. Ultimately, this machine has been ideal for Bridge Print,” said Willie. Impro Print Ltd is a digital and lithographic print company operating out of the Dargan Road in Belfast and run by Managing Director, Ernest Culley. Production Director is Pat Beattie. In December 2017, the company won Book Printer of the Year at the Irish Print Awards and was one of the finalists for the “Small Printer of the Year” category in 2016. Just over a year ago, Impro added the Duplo System 6000 to its printing suite, a machine described by Pat Beattie as “an excellent machine that’s hard, good and reliable.” A major benefit of selecting the Duplo 6000 was the ability to finish A4 landscape, a function not available on some other machines. Pat estimates that an annual run of one million books goes through the machine which despite being used on a daily basis, remains extremely reliable and durable. Before the new investment, Impro relied on the Duplo System 5000i. Well-functioning Duplo products have been at the centre of Impro’s operation for many years, with the company upgrading its models through Neopost as they come on the market. Impro is the longest standing Duplo customer in Ireland, having gone through six variations of Duplo machines. “Impro regularly invests in modern technologies, by upgrading our pre-press systems and implementing a fully integrated finishing suite. This helps Impro Print ensure they’re always using the latest and most up-to-date print finishing equipment from Duplo,” said Pat. Peninsula Print was established in 1986 in Newtownards, County Down. As a trade house with large digital and lithographic departments, Peninsula Print can’t always plan for the work coming in the door so it needed a flexible machine that could handle all requirements. In January 2016, the company acquired Ireland’s only Duplo iSaddle through Neopost Graphics, upgrading from the Duplo System 5000. The iSaddle boasts a wealth of features that have helped Peninsula Print satisfy the needs of its customers. “There are several benefits associated with an iSaddle. It has a three-knife trim, intelligent collating towers and produces a flatter saddlestitch book. It complements the Duplo DBM 6000i as both do A4 landscape. It also allows us to do two up work as the trimmer has a gutter-cut. The machine also has great flexibility in its run lengths and thickness so we can offer a quicker turnaround,” says Managing Director, Gary Withers. Peninsula Print is a long-time established customer of Neopost. “We’ve been buying Duplo products from Neopost for eight years and we’re very happy. Quality of service is a big consideration for us when purchasing a new machine and the service provided to us has been second to none,” says Gary.